Universal offers a variety of inks for specific applications. It is important to understand that ink formulations differ greatly and not all inks can be used in all products. Please read the descriptions for each ink carefully and pay particular attention to the recommended applications for each ink. All of the inks manufactured by Universal are formulated for industrial use only. Universal Type FD Marker Inks are fast drying petroleum base inks which are formulated for use in our refillable felt tip marking pens only. These dye type inks contain translucent dye colorants which are best used to mark on materials with light colored surfaces. The Type FD Inks dry in a few seconds and are use for both porous and non-porous surfaces. Universal Type P Stencil Inks are petroleum base pigmented inks which are formulated for use in our Roll-A-Stencil Jr. and Press Button Fountain Roller units only. Safety Data Sheets for Universal Inks can be downloaded in Adobe Acrobat Reader .pdf file format by clicking on the download SDS buttons. Button color corresponds to the SDS Sheet for that ink color. Universal Type D Stencil Ink is an alcohol base, non-porous, heavily pigmented ink formulated for use with our Roll-A Stencil Jr. roller and pad stenciling systems. This ink is weather proof and fade resistant and dries in approximately 1 minute at 75 degree F. temperatures. Formulated specifically for marking on metals, plastics, glass and other non-porous surfaces. Also excellent for marking on wood crates, pallets and other porous surfaces where fade and weather resistance is required. Suitable for use in Non-Porous Coders with resulting dry times of 10-15 seconds. Red, Green, Blue Yellow & White: Available in 4 oz. Reservoir Cartridges,Quarts and Gallons only. Universal Type M Stencil Ink is an alcohol base, non-porous, heavily pigmented ink formulated for use with our Roll-A Stencil Jr. roller and pad stenciling systems and Non-Porous Coders. This ink is similar in formulation to the Type D Stencil Ink but dries in half the time. Recommended for applications that require stenciling in very cold environments such as refrigerated storage areas or outdoors in cold climates. This ink is not recommended for stenciling applications in warmer temperatures as it will dry out in the rollers very rapidly. Universal #1150 Coder Inks are high quality glycol base coder inks formulated for use with our HP-100 and HP-200 series hand printers and all of our fix mount coders for applications requiring printing on corrugated cartons, paper and other porous surfaces. The 1150 Ink is also recommended for use in our USMR-20 series Micro-Spray Markers. These inks will never dry on metal, plastic or other non-porous surfaces at normal room temperatures. 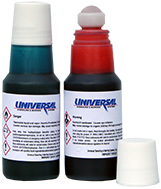 Universal #100 Coder Inks are extremely fast drying alcohol base coder inks formulated primarily for marking on plastic, metal, glass, rubber and other non-porous surfaces. These inks are recommended for use in our Non-Porous Hand Printers, Non-Porous fixed mount coders and USMR-20 series Micro-Spray Markers only. The #100 ink will dry in approximately 2 seconds at 75 degree F. ambient temperatures when applied with a non-porous coder. Red, Green, Blue, Violet, Yellow & White: Available in 4 oz. Reservoir Cartridges, Pints, Quarts and Gallons. Note: Yellow and White colors contain pigments for enhanced color density. Universal 4 oz. Reservoir Ink Cartridges are specially designed cartridges designed for use with our fixed mount coders. These cartridges feature a roller ball tip which, when installed on a coder, rides against the surface of the ink roll and applies a thin film of ink to the roll during coder operation. These patented, disposable, cartridges are available filled with #1150, #100, Type D and Type M Inks. They can also be ordered as empty assemblies for filling with customer's special ink formulations. Universal Type MT Ink Rolls Printing on Non-Porous surfaces has become even easier with the introduction of Universal's new disposable non-porous Type MT Ink Rolls. Designed for use in Universal's patented non-porous inking systems, the Type MT Ink Rolls deliver an average of 500,000 high density impressions. The fast drying ink formula adheres to practically any non-porous surface and dries in 4-6 seconds at 75 degrees F. When the roll is depleted, simply replace it - no re-inking, no mess! Kortho Hot Quick Coder Ink Rolls The Kortho Hot Quick Coder utilizes hot ink technology to provide sharp, opaque and nearly instant drying impressions. The ink rolls which are dry to the touch at room temperature, are pre-heated prior to use in the print heads self contained heating system. Hot Ink Rolls are available in Black, Red, Green, Blue Yellow and White. Universal FTX2 Markers Disposable paint markers available in Black, White and Yellow.